Step back in time on this 4-day Classical Persian tour from Tehran, seeing all the top attractions that date back to this fascinating era. Step back in time on this 4-day Classical Persian tour from Tehran, seeing all the top attractions that date back to this fascinating era. With overnight accommodation included and an expert guide to accompany you, the tour highlights the country’s most intriguing archeological sites – three of which are listed as UNESCO World Heritage Sites. Explore Golestan Palace, Masjed-e Jāmé of Isfahan, and Meidan Emam, Esfahan. after breakfast, you will visit National Museum of Iran, where you can see fabulous historical items from 5000 BC to the advent of Islam in Iran which shows a brief history of our Land. The National Museum of Iran now has two new complexes. The Museum of the (post-) Islamic Era which is consists of three floors. It contains various pieces of pottery, textiles, texts, artworks, astrolabes, and Adobe calligraphy, from Iran’s post-Islamic era and The Prehistory section of the National Museum of Iran is devoted to artefacts ranging from the Stone Age to the Iron Age. Covering a wide spectrum of materials ranging from terracotta, metal, stone, and bitumen. Then we visit the Treasury of National Jewels inside the Central Bank of Tehran, you’ll be dazzled by a breathtaking collection of crown jewels, many of them gathered from around world during the Safavid Dynasty that ruled from 1502 to 1736. Also part of this glittering collection is the Naderi Throne; made of wood, covered in gold, and encrusted with more than 26,000 precious gemstones, some believe that this throne was inspired by the legendary Peacock Throne of Shah Jahan, the Mughal Emperor who built the Taj Mahal. This day we take you a World Heritage Site, the lavish Golestan Palace. Built during the Qajar Dynasty that rose to power in the late 1700’s, this fabulous walled complex is centered on a landscaped garden with tranquil pools. Many of the elements you’ll admire today date to the 19th century when local Qajari architects and artisans were looking to integrate traditional Persian style with elements of Western and Russian origin. The palace buildings are among the oldest in modern Tehran and they are still regarded as a crowning achievement of the Qajar era. In afternoon you’ll’ fly to Isfahan. Isfahan as the 17th-century capital of the Safavid Empire, Isfahan was one of the world’s greatest cities – architecturally striking, wealthy beyond imagine, and politically powerful with Europeans, Ottomans, Indians and Chinese coming to its court – the heart of a vast Persian Empire that stretched from the Euphrates River in present-day Iraq to the Oxus River in Afghanistan. Indeed, its grandeur inspired the rhyming proverb, Isfahan Nesf-Jahan (Isfahan is Half the World). You’ll join our expert guide to begin your exploration of the city, starting with some of the centuries-old, still elegant bridges that span the Zayandeh River. The 14th-century Shahrestan Bridge, for example, evokes the greatest aqueducts of ancient Rome and is the oldest bridge in Iran. Other famous bridges on the Zayandeh River are Sio-ce-pol and Khaju. Their aOtherce gates below the bridge to let the water runoff from Zayandeh River in the spring, and there are beautiful stony archways above each gate. These archways provide a great acoustic place for every man who wants to sing. You can always find a man or a group of men singing under the bridge. The songs are usually about betrayal or unrequited love. You have the chance to chat with these men and listen to their songs. Continue your exploration in Isfahan at another UNESCO World Heritage Site. Simple at first glance but wondrous in its rich detail and bold design, the Masjed-e Jamé is another masterpiece of Iranian architecture, covering nearly 5 acres in the heart of this historic city. This is one of the oldest congregational mosques in the country, and its construction and embellishment over the past twelve centuries illustrate a number of important periods in Islamic architecture. This afternoon, your exploration continues in Imam Square. This 17th-century site is one of the largest public spaces in the world. Here in the square, you’ll visit the 17th-century Shah Mosque, revered as a masterpiece of Islamic architecture and easily recognized by its magnificent tile-work and soaring cupola and minarets. In the Ali Qapu Palace, you’ll marvel at its beautiful music rooms and the balconies where Safavid kings would sit to enjoy the polo matches unfolding in the square below. You’ll end your day exploring the Qeisarieh Bazaar that surrounds Imam Square. With hundreds of local vendors that specialize in traditional arts and crafts, it’s a wonderful place to shop for pottery, enamel, jewelry and delicately inlaid board games. Today we drive to Kashan to visit Bagh-e Fin Garden. This very early Persian garden reflects ancient landscaping principles that trace their roots to the time of Cyrus the Great in the 6th century BCE. Today, it’s a delightful setting where you can meet young Iranian families who are out to enjoy their day. You’ll also visit the historic Borujerdi House here in Kashan. With fine decorative motifs handcrafted of stucco, impressive domes, wall paintings and inlaid mirror mosaics, this former merchant’s home is regarded as a masterpiece of traditional Persian architecture. It also boasts 130-foot tall wind towers to catch lofty breezes that can cool the entire house. 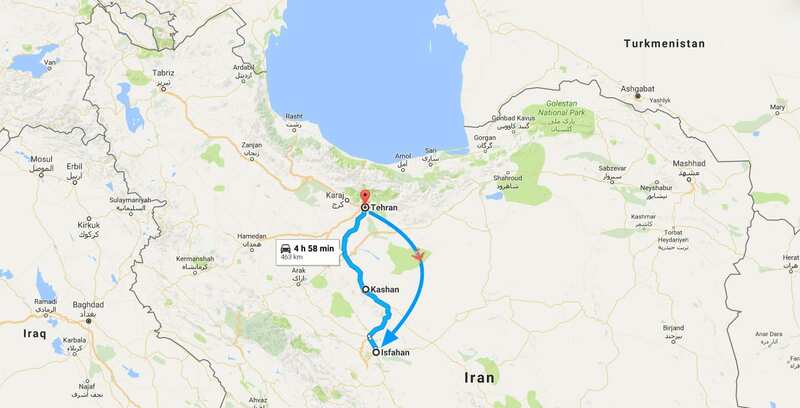 Then Drive to Tehran and transfer to the airport and fly back home.